At this point in the week, early mornings and late nights have become a routine – one that I rather enjoy, in fact. 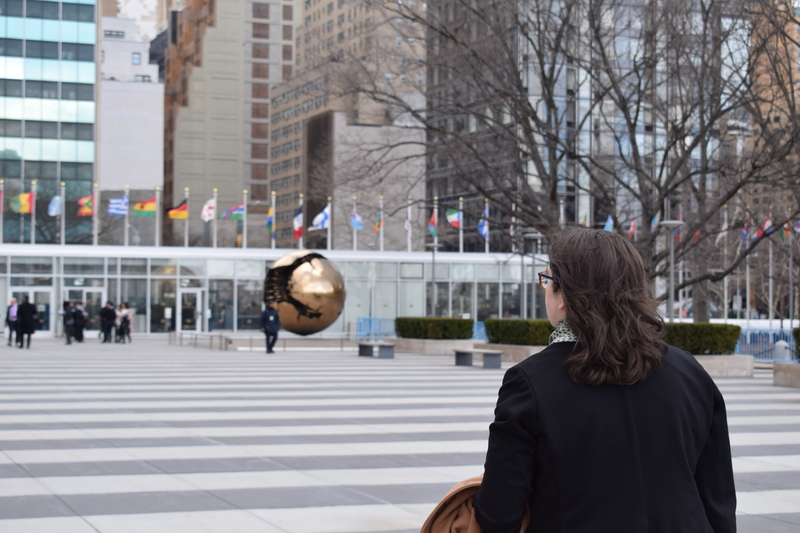 The knowledge that, upon waking up every day, I await any number of new experiences and connections at the United Nations headquarters is one that easily overrides any fatigue I may feel. Our delegation had the remaining two of four visits to Permanent Missions to the United Nations today at the Canadian and Syrian missions. The Canadian visit was of greatest interest to many of us as we are particularly keyed into women’s issues in Canada, perhaps more than anywhere else due to our geographic location. Our meeting was held with First Secretary (Human Rights and Social Affairs) Cameron Jelinski, with whom IRSAM delegations in the past have maintained good relations. We were interested in asking about Canada’s recognition of and support for indigenous women at the Commission on the Status of Women. As the annual theme of CSW62 pertains to rural women, it was important to us that these questions be asked in hopes of better understanding whether or not the Canadian government is truly dedicating the time, energy, and funds necessary to advance the voices and perspectives of indigenous people. Mr. Jelinski stated that, in regard to the release of the recent Trudeau government budget and the rollout of the Feminist International Assistance Policy (FIAP), indigenous women’s groups have expressed cautious optimism. However, the process of more fully incorporating indigenous groups into the fold of the UN system through the creation of an accreditation-granting mechanism has proven to be difficult due to the accrediting process of ECOSOC. This stalled progress was noted by Mr. Jelinski as disappointing but ultimately a priority of the Canadian Permanent Mission to the UN – only time will tell how this vital mechanism pans out if it is indeed a priority. The first two side-events I attended weren’t particularly interesting – I’ve learned this week that even though a panel might have an interesting title and be hosted by compelling governments, organizations, or individuals, it by no means results in a quality event with content of great substance. I therefore made a point of venturing away from the UN Headquarters and over to the New York City Bar Association near Times Square for an event on legal frameworks that benefit rural women. It was a risky decision to walk so far away from other events in terms of best using my time, seeing as there were a number of equally fascinating talks occurring simultaneously at the headquarters, but one that most certainly paid off. 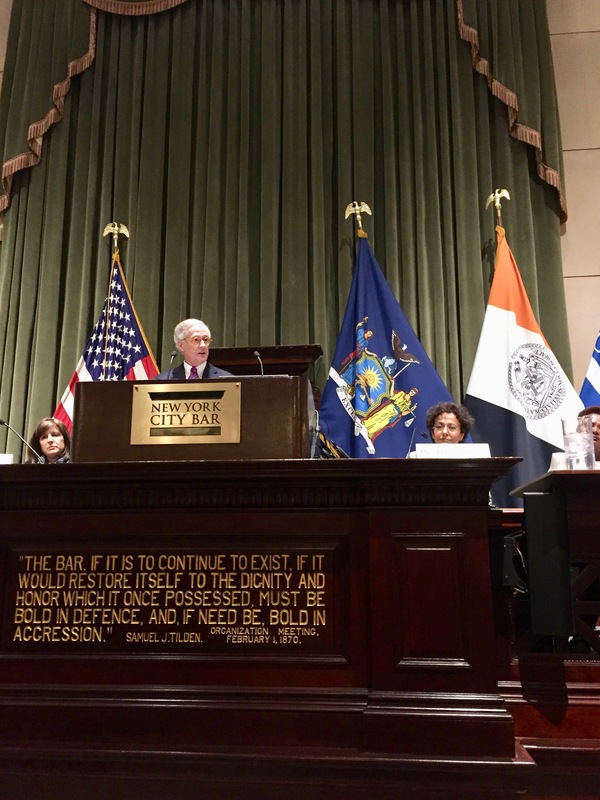 The NYC Bar Association was not only a beautiful venue aesthetically but the quality of speakers, the ambiance of the room, and the cocktail receptions both before and after the event were also much greater than that of panels held at the headquarters. I had the chance to speak with Christine A. Carron, a McGill University Faculty of Law graduate and retired Senior Partner of Norton Rose Fulbright – Montréal. She spoke in relation to her work with the non-governmental organisation HelpAge International, where she helped institute alternative legal frameworks of restorative justice to protect rural women from persecution for witchcraft in rural Tanzania. It was a valuable experience to meet a local Montrealer at an event of such great interest to me in such a venerable location. Sometimes these events are so much more than merely the content of the events themselves and must be considered holistically in order to best make use of one’s precious time at the United Nations.